A good re-released movie — hell, even a bad one — makes us realize not only where weve been but where we are. It brings to mind the proverbial frog in the pot of boiling water. Were the frog, the pot of water is our culture, and slowly were being cooked without realizing it. A cultural artifact, like an old movie, simply shows us how. Alien, the 1979 sci-fi thriller from Ridley Scott, which is being re-released in a directors cut just in time for Halloween, is perfectly positioned to do this. It was produced in the post-Star Wars hubbub over anything science fiction, but owes more to 2001: A Space Odyssey and classic horror movies in terms of pacing and content. It spawned three sequels (and counting: Alien Vs. Predator is due out next year) by three different directors (and counting: Paul W.S. Anderson), and each has its fans. According to the American Film Institute — which loves lists as much as the E! channel — Alien is the sixth greatest American thriller ever made, its villain is the 14th greatest villain and its hero, Lt. Ripley (Sigourney Weaver), is the eighth greatest hero. It made a star out of Weaver while two of its principals, actor Ian Holm and director Ridley Scott, have since been knighted. Thats a hell of a legacy for one film. Can Alien possibly live up to it? It does. And itll still scare the pants off you. The most startling thing watching Alien again is its pacing. For the first 45 minutes, little happens. Its all slow, exquisite build-up, which makes the second half seem all the more horrific. The film begins when the computer on the cargo ship Nostromo detects a distress call from a distant planet and wakes up its crew, which was in stasis en route to Earth. The feel here is slightly groggy, as if the film, as well as the crew, still hasnt completely woken up yet. Were all in a daydream that quickly turns into a nightmare. In James Camerons overrated Aliens, released seven years later, the crew was cartoonish — a macha Latina, a gung-ho Marine who folds under pressure, not to mention Ripleys superwoman — but here theyre subtle, recognizable people. We even encounter issues of class aboard the Nostromo. Parker (the wonderful Yaphet Kotto) and Brett (Harry Dean Stanton) are blue-collar workers getting a smaller bonus than the others, and theyre not happy about it. Theyre even less happy about the distress-signal investigation and drag their feet the whole way. Class issues are not only nonexistent in most futuristic movies (as if, in the future, well all be equal) but in most contemporary movies as well (as if, in the present, we like to pretend were equal). For this and other reasons, the film feels more adult than most supposedly grown-up films released today. On the planet, of course, is where we first encounter the alien spaceship. Ill admit there are anachronisms in Alien — the way the computer teletypes its commands using a green, monochromatic display — but theres nothing dated about H.R. Gigers Academy Award-winning special effects, which remain ominous, towering achievements. The big question with directors cuts of classic movies is this: Do they blow it? Scott doesnt. He trims some scenes, and what he adds, adds to the story: a nice confrontation between the emotional Lambert (Veronica Cartwright) and the by-the-book Ripley; and a legendary scene, called The Nest, which reveals the fate of Brett and Dallas (Tom Skerritt), and which was originally trimmed because of pacing concerns. 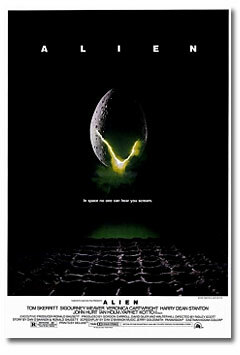 Another question: After the sequels, in which we saw countless, close-up aliens laying eggs, giving birth, and killing and cocooning too many humans to mention, can we go back to just one shadowy alien aboard one quiet ship? We can, and should. The first is still the best. This review originally appeared in The Seattle Times on October 29, 2003.